Follow these tips from Steele & Vaughn when moving into a smaller space. Follow these tips from Steele & Vaughn when moving into a smaller space. 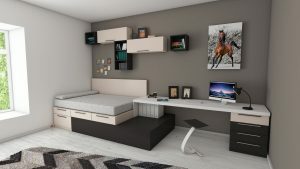 The first thing that you should do once you’ve decided to move into a smaller space is to take a realistic look at your lifestyle and the stuff that you have. Do you need those old skis or those large pieces of furniture that you bought when your kids were small? If you’re switching from a large family home to a smaller home there will probably be lots of items that you don’t really use anymore. Go room by room, including storage areas, and figure out what items you will actually use and what items you haven’t used in a long time. If you haven’t used it in the last year, get rid of it. Sell old items at a yard sale or donate them to charity. Remember to focus on the lifestyle you want to have for this next phase of your life. Only keep items that will fit that lifestyle. Trying to fit large furniture items into a small space can be frustrating and it can make you feel like the space is too small. Get rid of that big sectional for a smaller sofa or think about using comfortable chairs and getting rid of the sofa altogether. Look around your new home and think about what size furniture will fit best in that space. When you’re moving into a small space look for furniture that can do double duty like a pull out sofa, tables with hidden storage, and other furniture designed for small space living. By getting furniture and other items that are sized for a small space, you will be creating a comfortable and functional home that will suit the way you want to live now. If you are overwhelmed trying to decide what items to keep and what to get rid of, consider investing in a storage unit. Have your extra items moved into the storage unit instead of your new smaller home. That way you can take your time and make decisions when you don’t feel so stressed out and overwhelmed. It can be difficult to part with items that you have a sentimental attachment to, even if they don’t work well for your new home. Getting a storage unit and storing those items will make the transition easier emotionally because you won’t have to make a lot of difficult decisions all at once. Steele & Vaughn, one of the top moving companies in Greensboro, NC, is a great resource when it comes to moving into a smaller home. Call the experts at Steele & Vaughn today to get professional advice on downsizing to a smaller home.